Although I've worked not far from QV for years, I can't remember ever eating there before. 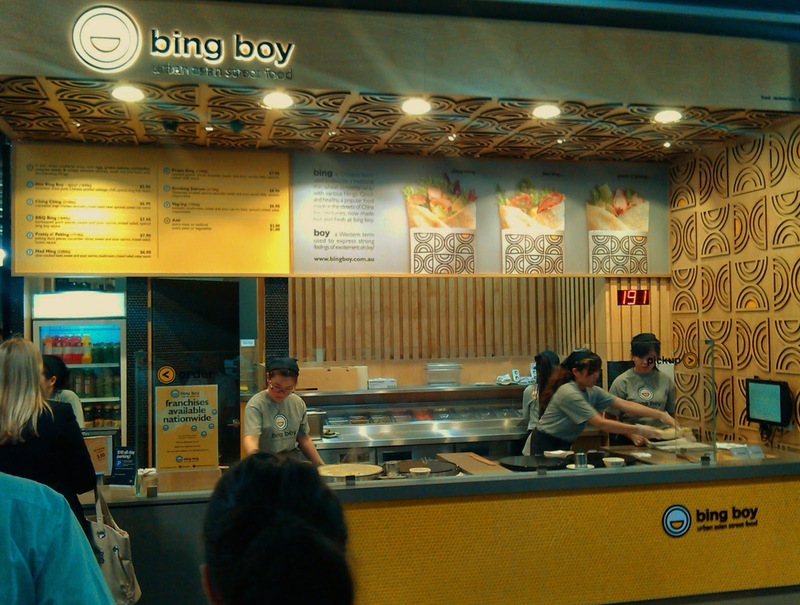 David suggested trying bing boy, which specialise in thin Chinese Crepes (Jian Bing) wraps with various fillings which are made to order in front of you. Apparently they have been made in the streets of China for centuries although I don't think I came across them when back packing there a few years ago, to be fair I didn't cover the whole country! We queued for a while, in front of the bright yellow store which gave me the change to select my filling and observe the process of cooking the super thin wheat omelettes and the wrapping of the ingredients. Once we'd ordered, it only took a few minutes before we had our warm lunch in our hands. 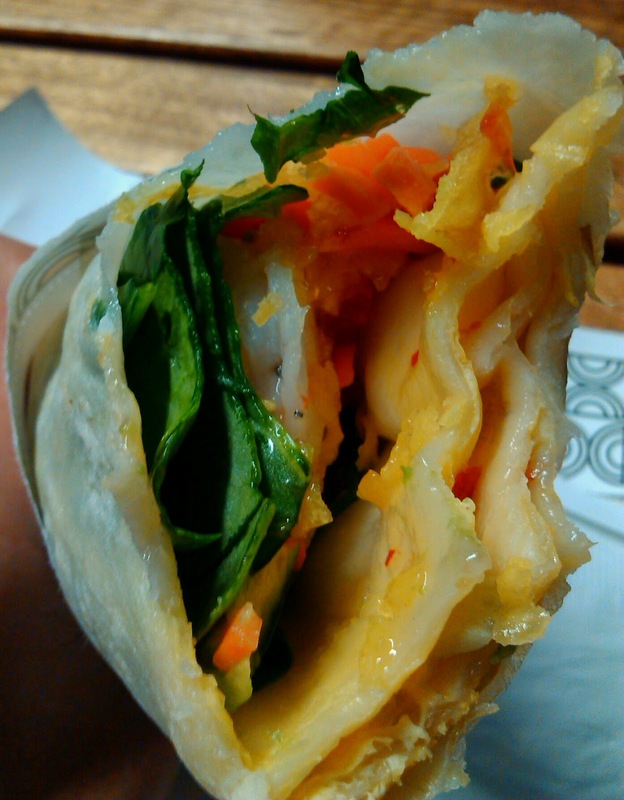 I went for the "Prawn King" with egg, coriander, spring onion and sesame seed omelette wrap filled with prawn, baby spinach, sweet and sour carrot, avocado, wonton skin and sweet chilli sauce. 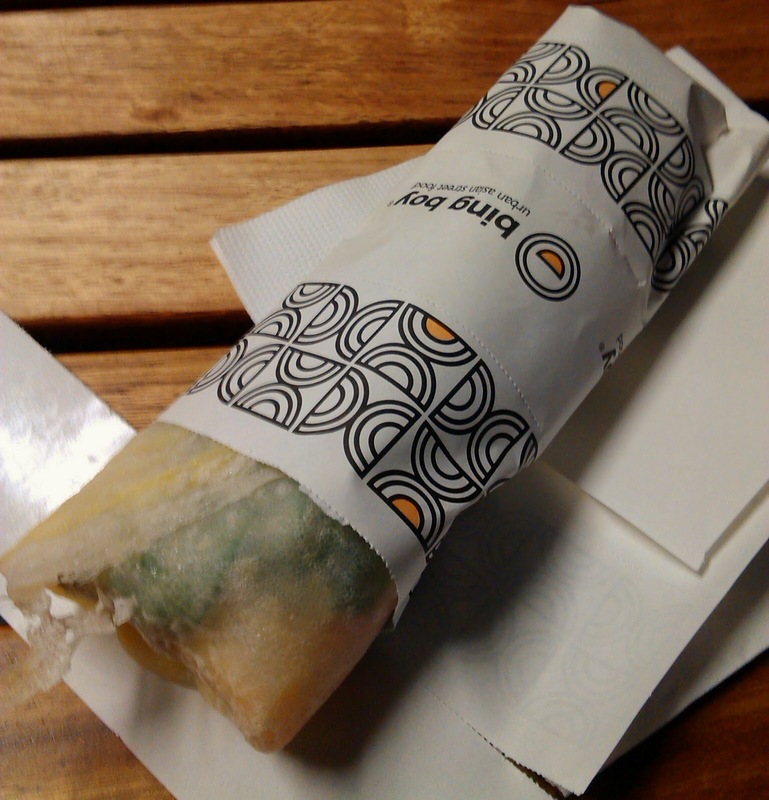 The wrap was contained in a handy tearaway-able paper wrapping. It was clearly fresh and tasty, the only downside being that the prawns were obviously pre-cooked and clearly cold, perhaps even straight out the fridge. I wouldn't mind trying one or two other of the options on offer, but I might try another branch of the chain as the cool crustacean was a bit off putting.